This film’s title seems entirely appropriate – no matter how much the central character tries to make amends, she only ends up destroying. This is a tense thriller, not only for moments of on-screen violence and gangster posturing, but for the hardened, determined, yet thoroughly dishevelled cop at the film’s centre. Detective Erin Bell (Nicole Kidman) is scoping the city for a bank burglar, Silas (Toby Kebbell), who has been reinstated in her criminal interest. As narrative disorientation is important here, flashbacks from 15 years back show Erin and her double agent beau Chris (Sebastian Stan) as they went undercover amidst these bank robbers, trying to foil their plan. There’s a high level of intensity and thrills in this character drama, and Kidman is instrumental in conveying this in her concisely powerful and violent role. This is a character who starts off as headstrong as can be, then becomes even more forceful as she aggressively fights back at all the setbacks in her way. 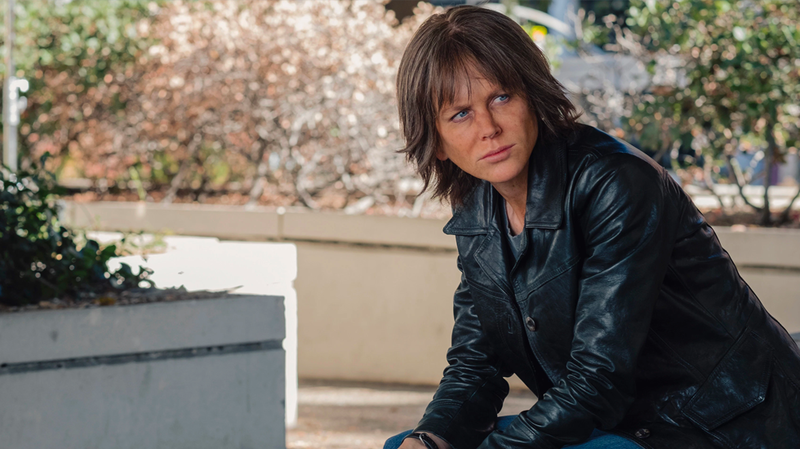 Situating herself between two timelines 16 years apart, Kidman powers her way both investigations, trying to make amends for her past actions, or the actions she’s about to partake in. The flashback scenes initially feel unnecessary in making this film nonlinear, but they soon begin to work alongside the modern day scenes, giving relative justifications for Erin’s emotional downfall. The tone of this film certainly isn’t cheery, in character, story, or aesthetic. There’s a hardened gruffness that makes Destroyer feel mostly authentic in its harsh outlook on the world, specifically in this part of Los Angeles. Director Karyn Kusama has crafted a confidently brutal piece of work that always has a visceral impact, even during the more subdued moments. Though some later moments of the film try too hard to establish a profundity on making our way through a dark and damaged world, most of Destroyer works brilliantly in concisely establishing such a conflicted person in a troublesome situation. Despite overdone and overcooked directing here and there, Destroyer works best in its most important, fundamental aspects – portraying a really messed-up person who’s trying to right the wrongs in spite of the odds, the largest of which is herself. That may not sound entertaining, but Kidman, Kusama, and co. certainly make this a hardboiled cop tale that can be enjoyed by those who appreciate a dark sensibility.